Collaborative, Participatory, and Empowerment Evaluation approaches have, at one time or another, been embroiled in controversy in the field of evaluation. Empowerment evaluation has received the most recent attention in this regard. The controversy began the moment empowerment evaluation was introduced with the American Evaluation Association's president address on the topic and the publication of the first book about empowerment evaluation -- Empowerment Evaluation: Knowledge and Tools for Self-assessment and Accountabilty. There were polar responses to the approach: early strong supportive comments and highly critical remarks - referred to as "The Debate." A more recent surge of activity has become evident with the publication of a recent issue of the American Journal for Evaluation and the release of Empowerment Evaluation Principles in Practice. These elements of controversy have been divided into three categories to facilitate review: current debate, early supportive comments, and "the Debate." Drs. 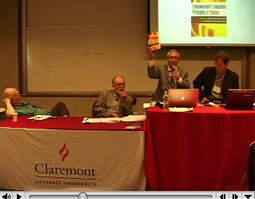 Fetterman, Patton, and Scriven engaged in a debate about the promises and pitfalls of empowerment evaluation at Claremont Graduate University. It was held August 24th 2009. Also see the Empowerment Evaluation blog for access to Dr. Fetterman's video tribute to international empowerment evaluators and his slides for the introduction to the debate. The introduction of empowerment evaluation to the field was received enthusiastically with highly supportive comments, validating the work of evaluators literally throughout the world. The AEA Presidential Address launching empowerment evaluation in the field also ignited "the debate", which resembled a very lively point-counterpoint exchange between leading theorists about the pros and cons associated with empowerment evaluation.